By	Dylan Bennett. Last edited by Marios Alexandrou. When you say to someone that you're fermenting something, they're probably thinking that you're brewing up a batch of moonshine, or perhaps some bathtub hooch. And while this may very well be true (no one is judging here), fermentation can also take place in other ways. Sourdough bread, for example, is an example of a fermented product. Creating compost without air is fermentation. At its core, fermentation the use of yeasts and bacterias to take sugars and convert them into either acid, alcohol, or gas. There are a vast array of products you can make at home that are fermented. 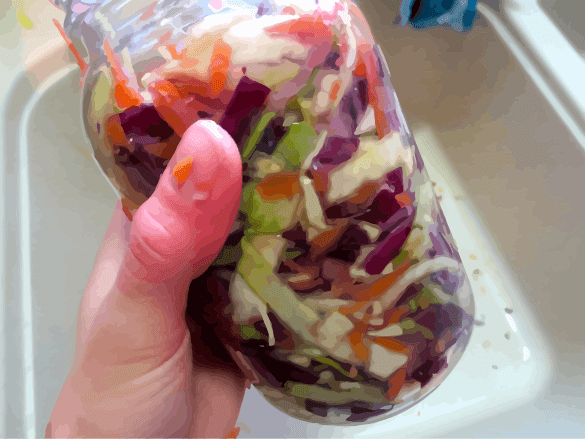 The ones I'll cover in this article are: Kombucha; Sauerkraut; Kimchi; and Vinegar. Kombucha and vinegar are examples of mother fermentation (that is, fermenting with what amounts to a giant wad of bacteria), while sauerkraut and kimchi are examples of lacto-fermentation (or using lactic acid to ferment the products). So what are all of these things, exactly? Well, l suppose for the sake of completeness, we can bring in alcohol fermentation as well. Alcohol is created by yeasts eating sugar and excreting both alcohol and carbon dioxide. Lacto-fermentation is utilizing the bacteria Lactobacillus and having it eat away at sugar in an anaerobic environment (i.e., without the presence of air) to create lactic acid. And mother fermentation uses a previously existing “mother”, which is a Symbiotic Colony Of Bacteria and Yeast, or SCOBY for short. It uses this to create both lactic acid and a little bit of alcohol (but not very much). a plate or lid to hold the cabbage down, plus a weight to go on top of it. The plate or lid should be able to fit just inside of your container. And that's it! To make 1 gallon of sauerkraut, grab 5 lbs. of cabbage and 3 tablespoons of salt. It's not much salt, but you probably don't need any more. Also, try to make sure that your cabbage is fresh so there's more water in it. If it's not then that's fine, but you'll probably have to top it up with some salt water afterwards. Cut up your cabbage. Typically it's sliced into long, thin strips, but you can do whatever you want. Chunk it up, leave the pieces big, grate it, the choice is yours. What you do will determine the consistency of your finished product. Take the shredded cabbage and put it into a large non-metal bowl. As you add it, sprinkle some of the salt in between the layers. Keep doing this until it's all in there, cabbage and salt combined, then mix it all around. Leave it to sit and the salt will start to wilt the cabbage. It will also draw the water out of the cabbage through osmosis. DO NOT THROW THIS WATER OUT. This is what you're going to use to create your anaerobic environment. If you'd like you can stir the cabbage around a bit, but it's best to just leave it for a couple of hours and let it do its thing. Take the now salty, wilted cabbage and pack it into your container. Tamp it down hard with your hand or the back of a wooden spoon so that there's no air trapped in between the pieces. Air would cause this delicacy to rot as opposed to ferment. Keep adding the cabbage and tamping it down until it's all in there, with no air. You should be able to press down on it and salty liquid should come up. If not then it's no worries; we'll just add some salt water to it in a bit, if we need to. Now take your plate and put it down on the cabbage, placing your clean weight on it. For the weight you can use a closed mason jar filled with beans or water. Leave it for 24 hours to allow the liquid to come up on its own. If it still isn't covered by then, you can add some salt-water at a ratio of 1 tablespoon salt per 1 cup of water. Make sure the salt is completely dissolved before you pour it on top. Now place your vessel in a place out of direct sunlight and cover it with your cloth (you could use cheesecloth, a t-shirt, a towel — anything) to keep out dust and flies. And that's it! Let it sit for a few days or weeks, checking it every day or two. If there's any mould on the surface or on the plate, you can just skim it off. It's just surface mould, and it's not getting into that salty environment you've created. Rinse off the plate and weight, then put it all back again. You can start eating it when you like the taste, and once you don't want it to ferment any more then put the rest in the fridge. a non-metal container with lid. A glass jar works well for this. Cut up the cabbage into large chunks (maybe 3 inches each) and salt them as per the sauerkraut. Mix it all around in the large bowl, then pour some cold water over it until the cabbage is submerged. Cover it and leave for 12-24 hours. The cabbage will be all wilted and extremely salty now, so we're going to rinse off some of that salt. But don't worry — there's still salt inside the cabbage, so it won't all go away. Put the cabbage into a colander and rinse with cold water, then gently squeeze some of the excess moisture out. You can pour out the brine water, or save it to use it for something else. Put the cabbage back in the bowl, and in the medium bowl mix together the other ingredients. Chop up the veggies, crush the garlic and ginger, then stir it all together so everything's coated with the spices. Add the cabbage and stir all that together, so the cabbage is coated as well. Now pack everything into your vessel as you did with the sauerkraut, making sure to get out any air. Put the lid on (but not too tight as gas will be released from the fermenting veggies) and let it sit for a few days to a week. Taste it every now and again and when it's at a place that you like, put it in the fridge. And you're done! Kombucha is a fermented tea drink that uses a wad of bacteria and yeasts called a “mother” or SCOBY. You will need a mother to get started, or if you have some kombucha already then you can let it sit out for a few days until one appears on the surface. That's how I got my first kombucha batch going: someone brought some to a potluck lunch, so I took a bit home and left it in a jar with cheesecloth over top. After about two days there was a little quarter-sized blob on the surface, and the next day it had expanded to by the size of a jellyfish! That was the mother, and that's what you use. If you don't have leftover tea lying around, you can just make some up. While it's hot, mix the sugar in until it dissolves, then let the whole thing cool down to room temperature. Strain out any tea leaves if they're in there, then pour the sugar-tea into a vessel to contain your kombucha. A jar could work, but this process uses airborne bacteria and yeasts, so something that's wider than it is tall would be good. This would give it more surface area to work with. A bowl or bucket would be okay. Add the mother, which may float on the surface but if it doesn't then that's fine. Add the kombucha as well, if you have it. Then cover the whole thing with a cloth or t-shirt or cheesecloth and let it sit for a few days to a few weeks out of direct sunlight. A new mother will grow on the surface, and the drink will start to taste more acidic. It's safe to drink at any stage, so try it out! I've found that black tea (maybe because of the tannins) make a very vinegary product very quickly, and green or other herbal teas tend to be more mellow. You can make easy-peasy vinegar by leaving alcohol out and letting time pass. The Acetobacter bacteria will be attracted to the alcohol and will come in, greedily slurping up that stuff and creating acetic acid in its place. Alternatively, you can take your alcohol and put a mother of vinegar onto it, fermenting it in the same way as you would kombucha. If you leave your vinegar out for a while, you may notice a mother forming on the surface. It's perfectly safe, so feel free to use it for your next batch, or eat it, or use it in cooking.